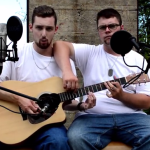 Two guys cover Eminem on the very same guitar! In that unique way that so many online viral things seem to have, there doesn’t seem to be much info on the guys in this video. Oh they’re fairly easy to track down. Laurier Lachance has a Facebook, Twitter, and YouTube. And Felix Desroches has a Twitter too. Heck they’re both even on Instagram. They’re in (or were in?) a band called Preeminent, and it’ easy to find their music online so go check them out. But there are slim pickings for filling out the rest of their story. So we’ll just have to be satisfied with the video. In this video Lachance and Desroches (How did they both end up with such awesome names?) 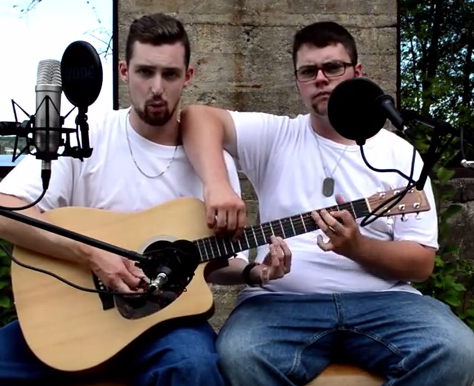 take on Eminem’s “The Real Slim Shady” on a guitar. That’s cool enough on it’s own. But it goes from cool to magical when you realize they’re doubled up on the SAME guitar! And to make things even better Lachance lays down a pretty impressive and fun imitation of Eminem too. In case you’re not familiar with Mr. Marshal Mather’s work (AKA Eminem) you should know he has a mouth on him that would make a fisherman’s wife blush. Sensitive-eared folks should NOT press play. The rest of ya’ll have at it!